Back Row (L to R): V. Byrne, L. Enright, B. O'Connor, J. Cosgrave, J. Elstead, M. Kiely, T. Mansfield, D. Whelan. Front Row (L to R): D. Barry, D. Murray, P. Enright, J. McGrath, P. Hogan, J. Hogan, P. McGovern. 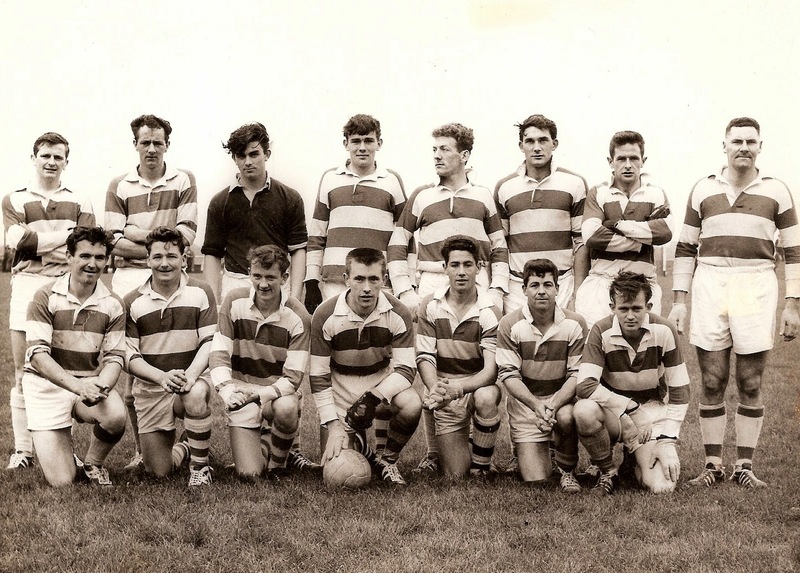 This week's photo shows the Ballinacourty Intermediate Football team that won the Western Championship in 1965. Comprehensive victories over Cappoquin and Affane set up a final appearance against Clashmore. At the final whistle, the green and white hoops had won on a scoreline of 2-8 to 0-2 and in the process secured the club's first divisional title at this grade. A few weeks later the players capped off a wonderful year with victory in the county decider against Rathgormack. Thus, Ballinacourty entered the senior ranks for the very first time. Our popular Jack the Joker Fundraiser will continue this Sunday night in Kennedy’s Live where the Jackpot will be €3,056 as on Sunday night Lar Power was drawn out of the drum and picked card 53 which wasn’t the Joker though he did win €50. Killian Lyons and Nora Tobin won €25 each. As well as our group of ticket sellers tickets can be purchased from Convenience Store Ballinroad, The Village Inn, Village Flowers, Kennedys Live, Spar, Mike Kiely’s Butchers and Mousies Takeaway. We played De la Salle on Friday night last at 8pm in Abbeyside in the first round of the County League and recorded a good win on the night. TEAM: S. ENRIGHT, N. DEE, R. DUNFORD, D. COLLINS, C. MOLONEY,S. O’HARE, J. POWER, J. HURNEY, J. O’MAHONEY, M. FERNCOMBE, M. FIVES, P. HURNEY, S. O’DONOVAN, M. O’HALLORAN, J. O’BRIEN. SUBS: R. SHEEHAN, G. BREEN, M. MAHER, D. FERNCOMBE. We play Tallow in the first round of the County league in Abbeyside tonight, Wednesday 26th at 8pm. This Friday night we are holding a fundraising table quiz in Minnies Bar at 9pm to help raise funds for the club. This promises to be a most enjoyable night and we appeal to as many people as possible to come along and lend their support. This Sunday our Club Bingo continues in the CBS Hall at 8:30 pm where the jackpot is €1350. Tickets for the 2014 Deise Development Draw are currently on sale from members of both our Adult and Juvenile Committees. Again this year there are a number of very attractive prizes on offer every month but the main attraction of the Draw is that as well as being in with a chance of winning one of these prizes you are supporting our club and helping us raise some badly needed funds to run the club. Our ticket sellers will be calling on the houses of the parish over the next number of weeks but if we manage to miss you and you wish to purchase a ticket then please contact any member of our Club Committee. One of our most loyal and dedicated Club Members Liam O’Connor is calling on all Abbeyside/Ballinacourty members, players, supporters, friends and cycling enthusiasts to support a Fundraising Cycle which he is organising on Saturday August 2nd. Liam is organising the cycle from Limerick to Abbeyside to raise much need funds towards the running and further development of the club. As you all know the club has had huge success on the playing fields last year and all our club teams and ladies represented the club with great pride throughout the year. The club would not be able to run as smoothly as it currently does without the huge volume of volunteers who give so much of their time to coaching teams, by working on committees and doing countless tasks in fundraising and all other events run by the club. The facilities in our club have been brought to a new level in recent years thanks to the generosity of all in our Parish who give very generously when club people come calling at their homes, work places, shops and businesses to raise funds to help pay for projects such as the refurbishment of the dressing rooms, installing state of the art floodlights and generator to run lights, the erection of a state of the art ball alley to improve hurling skills and the purchase of almost 8 acres and the developing of the third pitch which will cater for the needs of the club teams for many years to come. We would like to thank all those people who have dug deep into their pockets to allow the club to be able to provide all these amenities. Liam is calling on any who would like to join him on the cycle to let him know in the next few weeks. The cycle will cater for all levels of cyclists and will involve a trip of around 85 to 90 miles. Please contact Liam, Michael, Benny or Beanie to let them know of your interest and meetings will be organised to let people know of what it takes to be a part of a huge fun cycle. Liam can be contacted at 0851191908 or liam.oconnor@augh.com, Michael can be reached at michealcosgrave@hotmail.com or 0877682068, Benny can be contacted at benny.i.flynn@gsk.com or 087-9352716 while Beanie can be reached at liambyrnebeanie@yahoo.com or 087-6436046. On behalf of all in the club we would like to send our sympathies to the family and friends of the late Johnny Hourigan, Abbeyside, who passed away last week. Along with all his brothers Johnny wore our club jersey and was a great supporter of not alone our club but of many organisations in Abbeyside. Johnny tasted success with us as an underage player and remained a loyal supporter of our club after he finished playing. We would also like to send our sympathies to the Power family, Dungarvan on the death of Tommy (Snail) Power over the weekend. One of the finest footballers ever to grace the playing fields in Waterford, Tommy won numerous County Titles with John Mitchels, before going on to play with Ballinacourty for a number of years, which along with his near ever presence at matches in Fraher Field, or other venues in Waterford and indeed further afield ensured he had an enormous circle of friends in the GAA community. Once again we send our sympathies to Tommy’s family and friends on the passing of one the true characters of the GAA. Our indoor hurling for the juvenile hurlers continues again on this Friday night coming the 28th March at the Friary College. The under 5, 6 and 7 groups will between the times of six to quarter to seven and the under 8 group will between the times of quarter to seven and half past seven. All are welcome. Helmets are compulsory and will be available over the next few weeks. To help cover costs a €2 fee will apply. Membership forms will also be given out to parents of players who have not received them yet and also collected off those who have. Our under 8 football team took park in a football blitz in Cariganore on Saturday morning last. We played three games and competed well in all. All the young lads enjoyed themselves on the day and we would like to thank their trainers and parents for making it such an enjoyable day for all. Without the parents help and assistance these days out would not be possible. Our under 16 football team travelled across the bridge last week to take on their near neighbours Dungarvan in the third round of the county football championship. On the night however things did not go to plan and we were beaten by a very good Dungarvan team. We now have still two games to play in this championship and wins in these two games are vital if we are to qualify. Our minor football team was defeated on Sunday morning last in Tramore by the host club in the fourth round of the Minor football championship. Unfortunately we played very poorly on the day and were defeated. We still have a good chance of making the knockout stages of this competition and everyone in the club would also like to wish David Looby well who received a nasty injury in the game. Membership is now nearly over due for juvenile members. The club would ask that anyone who has not paid the membership fee yet would to please do so as soon as possible because without this paid there is no insurance on that player should they get hurt. 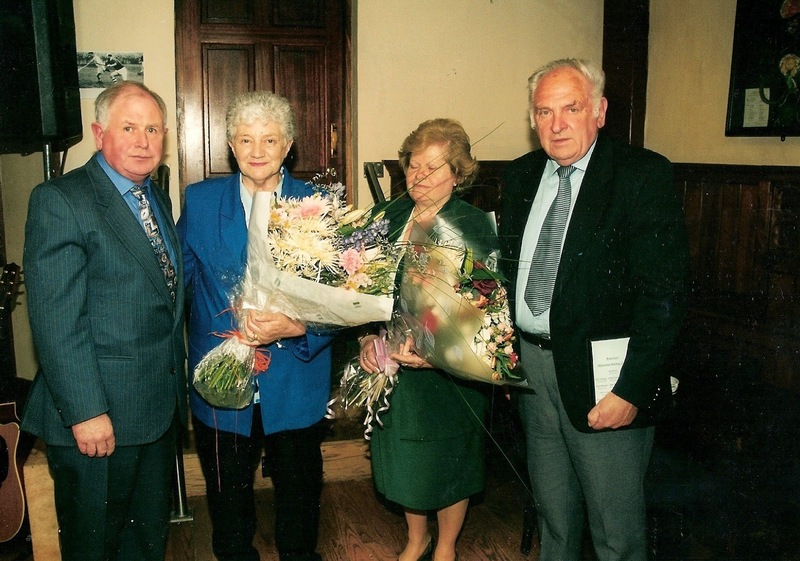 This week's photo comes from May 2001 and shows Austin & Sybil Flynn and Tony & Moira Mansfield on the occasion of a club presentation to Austin in recognition of his selection on the Waterford Hurling Team of the Millennium. Austin was the only Abbeyside player chosen on the team and a special event was held in Minnies to celebrate this honour. Our popular Jack the Joker Fundraiser will continue this Sunday night in Kennedy’s Live where the Jackpot will be €2,856 as on Sunday night Jack Kiely was drawn out of the drum and picked card 37 which wasn’t the Joker though he did win €50. Roisin Briggs and Melissa Kiely won €25 each. As well as our group of ticket sellers tickets can be purchased from Convenience Store Ballinroad, The Village Inn, Village Flowers, Kennedys Live, Spar, Mike Kiely’s Butchers and Mousies Takeaway. We play De La Salle this Friday night at 8pm in Abbeyside in the first round of the County League. On behalf of all in the club we would like to send our sympathies to the family and many friends of the late Kathleen Organ, Coolagh Road, who passed away last weekend. Kathleen and her husband Liam were great supporters of our club and the Abbeyside or Ballinacourty flag would fly proudly from their home whenever any of our teams would contest County Finals. Kathleen’s sons Joe, Timmy, Liam and John wore our jersey for many years helping in the winning of many County Titles for over two decades, with Timmy being a member of the three in a row Minor football team while John captained the club to under 14 and Intermediate County Titles, and this tradition was carried on by Kathleen’s grandson Jamie in recent years. Once again we send our sympathies to Liam, Kay, Joe, Timmy, Liam and John and all of Kathleen’s family and friends. Training will take place for all age groups on Friday 21st at 6pm. New members are always welcome and hurleys and helmets can be purchased at a discounted price through the club. 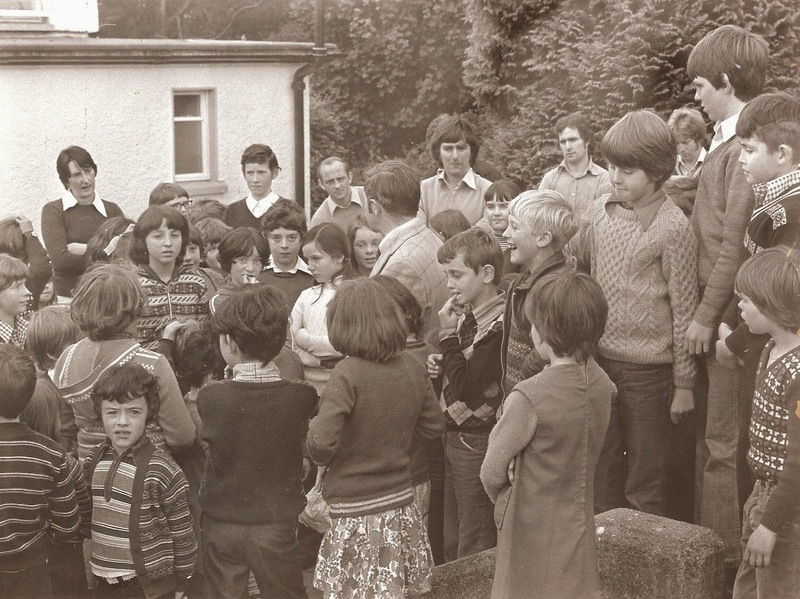 This week's photo comes from October 1978 and shows members of the club's County Senior Football Championship winning team on a visit to Garranbane National School a few days after the 0-13 to 2-4 victory over Clashmore at Fraher Field. Among the players pictured who annexed the club's first ever senior title are Pat Enright, Jim Kiely, Michael O'Connor and Michael Fraher. Our popular Jack the Joker Fundraiser will continue this Sunday night in Kennedy’s Live where the Jackpot will be €2,602 as on Sunday night Mossie Joyce was drawn out of the drum and picked card 5 which wasn’t the Joker though he did win €50. Bernard Gorman and Joe O’Brien won €25 each. As well as our group of ticket sellers tickets can be purchased from Convenience Store, Ballinroad, The Village Inn, Village Flowers, Kennedys Live, Spar, Mike Kiely’s Butchers and Mousies Takeaway. This Sunday our Club Bingo continues in the CBS Hall at 8:30pm where the jackpot is €1300. One of our most loyal and dedicated Club Members Liam O’Connor is calling on all Abbeyside / Ballinacourty members, players, supporters, friends and cycling enthusiasts to support a Fundraising Cycle which he is organising on Saturday August 2nd. Liam is organising the cycle from Limerick to Abbeyside to raise much need funds towards the running and further development of the club. As you all know the club has had huge success on the playing fields last year and all our club teams and ladies represented the club with great pride throughout the year. The club would not be able to run as smoothly as it currently does without the huge volume of volunteers who give so much of their time to coaching teams, by working on committees and doing countless tasks in fundraising and all other events run by the club. The facilities in our club have been brought to a new level in recent years thanks to the generosity of all in our Parish who give very generously when club people come calling at their homes, work places, shops and businesses to raise funds to help pay for projects such as the refurbishment of the dressing rooms, installing state of the art floodlights and generator to run lights, the erection of a state of the art ball alley to improve hurling skills and the purchase of almost 8 acres and the developing of the third pitch which will cater for the needs of the club teams for many years to come. We would like to thank all those people who have dug deep into their pockets to allow the club to be able to provide all these amenities. Liam is calling on any who would like to join him on the cycle to let him know in the next few weeks. The cycle will cater for all levels of cyclists and will involve a trip of around 85 to 90 miles. Please contact Liam, Michael, Benny or Beanie to let them know of your interest and meetings will be organised to let people know of what it takes to be a part of a huge fun cycle. Liam can be contacted at 0851191908 or liam.oconnor@augh.com, Michael can be reached at michealcosgrave@hotmail.com or 0877682068, Benny can be contacted at benny.i.flynn@gsk.com or 087-9352716 while Beanie can be reached at liambyrnebeanie@yahoo.com or 087-6436046. On Thursday night last we held the County Board GAA Quiz in Alice O’Connor’s Bar. There was a good turnout of teams on the night and we would like to thank Sean Kiely for all his work in organising the quiz on the night. Our minor football team played their second game of the county championship on Saturday last against the Brickies. After a good game of football we came out on top and have now won our first two games of this championship. On St. Patrick’s morning we play Dungarvan. Our under16 football team played at home last Wednesday night against The Nire. On what was a terrible night for football both teams showed great skill and determination in the dreadful weather conditions. In a game that was very closely fought throughout it was the lads from Ballymacarbery that came away with the spoils. However this team has still a few games left in the qualifiers to see can they reach the knockout stages of the championship. Our indoor hurling for the juvenile hurlers continues again on this Friday night coming the 14th March at the Friary College. The under 5, 6 and 7 groups will between the times of six to quarter to seven and the under 8 group will between the times of quarter to seven and half past seven. All are welcome. Helmets are compulsory and will be available over the next few weeks. To help cover costs a €2 fee will apply. Membership forms will also be given out to parents of players who have not received them yet and also collected off those who have. Wall ball training continues every Friday evening with Ritchie at 5.00 to 6.00pm. A bus will leave the Eurospar carpark Sunday 16th at 12.30 to travel to Clonmel to the All-Ireland Intermediate Club final at a cost of ten euro per person. Anybody wishing to travel are asked to contact Ritchie on 0879931579 or Carmel on 0872598923 before Thursday. May we take this opportunity to wish Lismore the very best of luck as they go in search of All-Ireland Club glory. Back Row (L to R): G. Foley, D. Ruske, T. Collender, M.Organ, L. Fraher, G. Flynn, J. O'Connor, D. Whelan, A. Flynn, L. Whelan. Front Row (L to R): J. Morrissey, Patcheen Whelan, J. Clancy, J. Hogan, N. McGovern (Capt. ), M. Fives (Mascot), L. O'Dea, T. Barry, P. Clancy, Paddy Whelan. This week's photo was taken on the occasion of Abbeyside's first ever appearance in a County Senior Hurling Championship Final. The match took place on September 11th 1955 in the Fraher Field and saw the Village team go down by three points, 2-10 to 3-4 to Mount Sion. Our popular Jack the Joker Fundraiser will continue this Sunday night in Kennedy’s Live where the Jackpot will be €2,376 as on Sunday night Mary Rossiter was drawn out of the drum and picked card 1 which wasn’t the Joker though she did win €50. Clodagh Caufield and Jacqueline McGrath won €25 each. As well as our group of ticket sellers tickets can be purchased from Convenience Store Ballinroad, The Village Inn, Village Flowers, Kennedys Live, Spar, Mike Kiely’s Butchers and Mousies Takeaway. On Sunday last we were defeated by a strong St. Oliver’s side in the Western Semi Final in Fraher Field. We would like to thank the players and management team for their efforts and commitment during their two games. TEAM: K. DWANE, C. ’DWYER, E. BERGIN, S. O’GORMAN, S. O’CONNOR, B. LOOBY, C. McCARTHY, C. PRUNTY, C. KINDREGAN, B. HENLEY, S. CLIFFE, D. SWEENEY, D. LOOBY, M. MAHER, R. PROCTOR. SUBS: J. DUGGAN, K. DEE, E. YOUNG, P. COLLINS, R. CONWAY. This Sunday our Club Bingo continues in the CBS Hall at 8:30 pm where the jackpot is €1250. Over the past number of years we have carried out some extensive work to our club facilities to enable our own Club Members to avail of the best of facilities which we can provide. We have been able to carry out this work thanks to the generous support of many of our loyal members and supporters. We emphasise that these facilities are for the use of our own paid up members and we will not tolerate any kind of intimidation of our members by any “guests” or “visitors” to our club grounds in the future. To date a number of County and indeed other Club teams have availed of our facilities and these teams are all most welcome to use them provided they are booked accordingly through Michael O’Donovan, but we once again stress that individuals are neither allowed or welcome to simply enter our club grounds and prevent our own members from using these facilities and if such behavior continues we will take these matters further. One of our most loyal and dedicated Club Members Liam O’Connor is calling on all Abbeyside/Ballinacourty members, players, supporters, friends and cycling enthusiasts to support a Fundraising Cycle which he is organising on Saturday August 2nd. Liam is organising the cycle from Limerick to Abbeyside to raise much need funds towards the running and further development of the club. As you all know the club has had huge success on the playing fields last year and all our club teams and ladies represented the club with great pride throughout the year. The club would not be able to run as smoothly as it currently does without the huge volume of volunteers who give so much of their time to coaching teams, by working on committees and doing countless tasks in fundraising and all other events run by the club. The facilities in our club have been brought to a new level in recent years thanks to the generosity of all in our Parish who give very generously when club people come calling at their homes, work places, shops and businesses to raise funds to help pay for projects such as the refurbishment of the dressing rooms, installing state of the art floodlights and generator to run lights, the erection of a state of the art ball alley to improve hurling skills and the purchase of almost 8 acres and the developing of the third pitch which will cater for the needs of the club teams for many years to come. We would like to thank all those people who have dug deep into their pockets to allow the club to be able to provide all these amenities. Liam is calling on any who would like to join him on the cycle to let him know in the next few weeks. The cycle will cater for all levels of cyclists and will involve a trip of around 85 to 90 miles. Please contact Liam, Michael, Benny or Beanie to let them know of your interest and meetings will be organised to let people know of what it takes to be a part of a huge fun cycle. Liam can be contacted at 0851191908 or liam.oconnor@augh.com, Michael can be reached at michealcosgrave@hotmail.com or 0877682068, Benny can be contacted at benny.i.flynn@gsk.com or 087-9352716 while Beanie can be reached at liambyrnebeanie@yahoo.com. or 087-6436046. This Thursday night, March 6th Alice O’Connors will be the venue for our Club members who wish to take part in the County Board Radio Quiz with proceedings getting under way at 8pm. Our indoor hurling for the juvenile hurlers continues again on this Friday night coming the 7th March at the Friary College. The under 5, 6 and 7 groups will between the times of six to quarter to seven and the under 8 group will between the times of quarter to seven and half past seven. All are welcome. Helmets are compulsory and will be available over the next few weeks. To help cover costs a €2 fee will apply. Membership forms will also be given out to parents of players who have not received them yet and also collected off those who have. This Saturday we play Brickey Rangers in the County Championship in our own club grounds. Back Row (L to R): Declan Coleman, David Mulligan, Conor Clancy, Michael Collins, John Mulligan, John Moloney, Michael Hanrahan, Liam Shanley, Séamus Feehan, Donal Looby, Marty Kiely, Eddie Cashin. 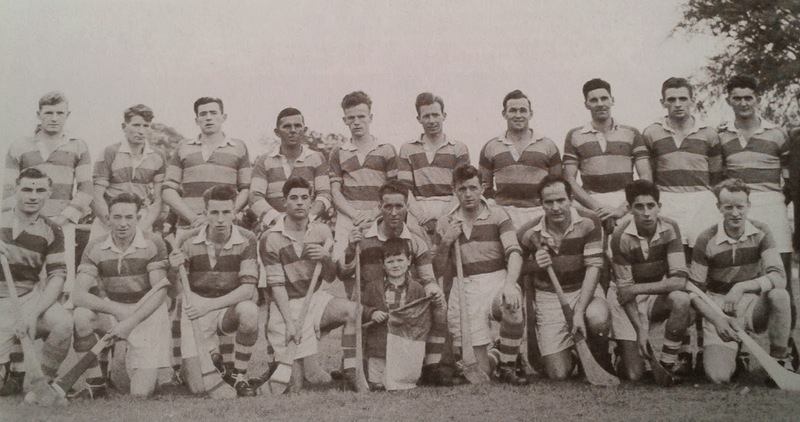 Front Row (L to R): Michael O'Riordan, Kevin Mulvihill, Maurice Foley, Tommy Wade, Johnny Burns, Jim Collins, Jimmy Healy, Ray Moloney, Gerry O'Connor, Jim (Tiger) Kiely, John Curran. This week's photo takes us back 30 years to Ballinacourty's County Senior Football Championship victory (3-4 to 0-3) over Clashmore at Fraher Field. Many of those pictured here are still involved in various aspects of the club today.